It looks like an error has caused some blocks to be replaced in the chunk yes, if you mark the area on a map, then I'll restore the chunk to an earlier version next time I world edit. 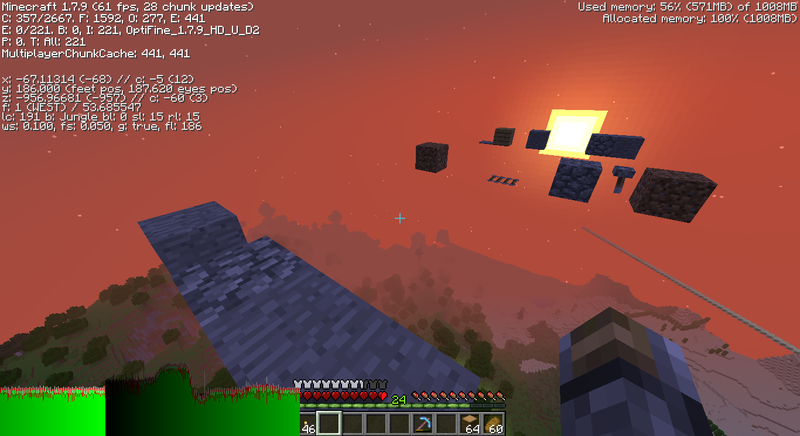 I suspect it's still possible to interact with the chunk though and it's not corrupted as such. But the fact that it got corrupted in the first place is a big problem. Do you know when this happened? When this happened in early Blacraft it was after my com got a BSoD. I don't have to restore the entire world because this happens in a few chunks. I only have to replace the chunks. I didn't know a lot about world editing when the server was very new. All I learned was from managing the server. it's been there for at least 6 months or so. i only noticed after i built the roof because i wasn't high up enough to see it. there's only a few blocks so i can just remove it manually instead of loading an earlier chunk? I spotted those months ago, I assumed that they were just a glitch though. So yeah, 6 months at least, possibly more. It would take a lot of time (or if it's done in bulk with the other world editing not very long), but I don't think doing it is justified in the first place. Bukkit will probably take a while to update like in the past, so I don't think there's any need to rush. In any case I don't know when I'll have time to do all those things atm. I propose this cropping plan for 1.8, where areas surrounded by red are preserved. The plan is based on the 1.7-1.8 transition being seamless without chunky borders as the code as far as I know hasn't been changed in ways that make chunky borders at the transition. I haven't tested this. 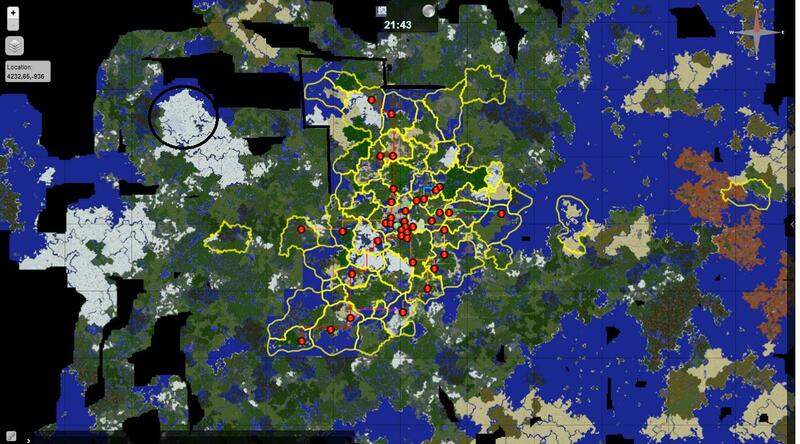 So it's going to be as tight as possible so we can have plenty of granite and areas with increase in ores etc. (Idk how the postgen thing works, if that would generate in 1.7 lands when they get loaded the first time). Tell me if there are any more areas that need to be preserved or other changes are needed. Maybe keep more of that eastern mesa? Otherwise looks good I guess. Could you mark the area and why? Remember, the plan assumes the land will generate in the same way. A savannah from 1.7 will just regenerate in 1.8 with granite and all that. We only need to crop to preserve stuff we've made. - Quontex's mushroom island has been moved next to Dothian Desert and Dimwood. 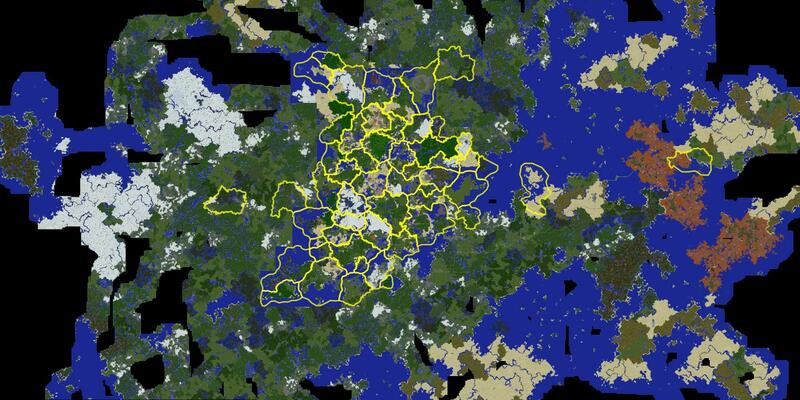 New terrain will generate east of Quontia, that should fit with the terrain to the east and north. - 5 chunks around Yukiland and Zuntriio have been replaced with chunks from a backup from August 9, 2012, after the 1.3 cropping. - Smoothed biome transitions between Swamphold and the land west of it, and changed Spawntown's park from forest to savannah. - Verified that the worldgen seed isn't broken. - Cropped the nether leninently. The remaining parts can be seen below. The temp world is still up, these are just the changes that have been made. i'm confused about the nether map. what does the blurry parts / checkboard pattern parts / grey colored parts / empty blue parts all mean? Blacraft is now running Spigot 1.8.1 and the world has been re-cropped according to the cropping plan above. So as of recently I've noticed that it doesn't snow anymore in my city (Yukitown in Chazabethia), but rains. It was odd because I remembered it snowed a few updates ago, but I suppose something must've changed it, so I request that in the next time the world is edited or changed, the taiga biome in the region be changed to the snowy taiga biome so that it may snow again. Done, Yukitown's biome has been changed from taiga to cold taiga.